Heat oven to 350°F. Spray 13x9-inch (3-quart) glass baking dish with cooking spray. Spread 1 cup of the pasta sauce in dish. To remaining sauce in jar, add water and mix well. Cut sausage links in half lengthwise; remove casings. Shape each piece of sausage into roll; stuff into uncooked pasta shell. Place stuffed shells on sauce in dish. Pour remaining pasta sauce mixture over shells. Cover tightly with foil; bake 1 hour 20 minutes. Sprinkle with mozzarella and Parmesan cheeses; bake uncovered 10 minutes longer or until cheeses are melted and pasta is tender. Let stand 10 minutes before serving. If you have bulk Italian sausage, divide it into 14 pieces. 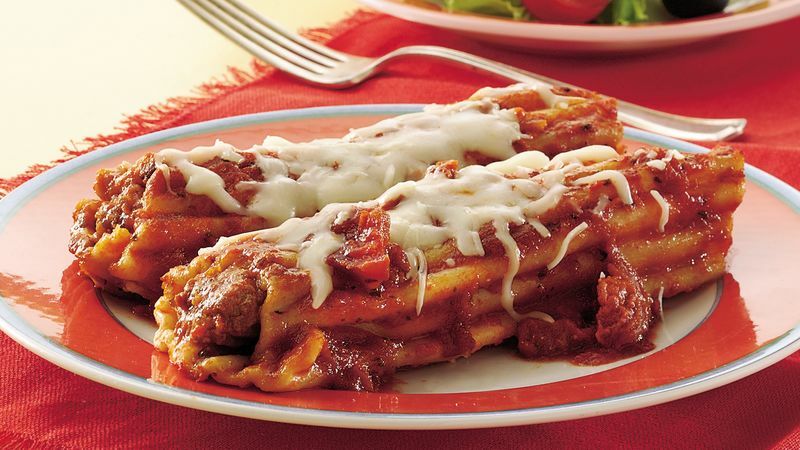 Shape each piece into a roll and stuff into a manicotti shell. Do not use smoked or precooked sausage.